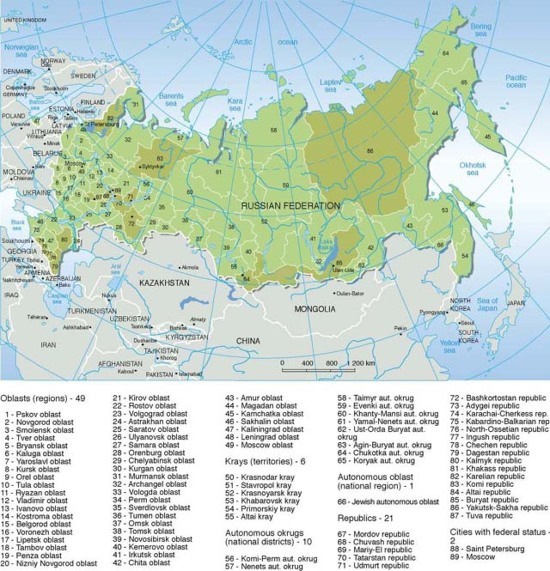 The map shows the administrative regions (oblasts), territories, national districts and republics of Russia. 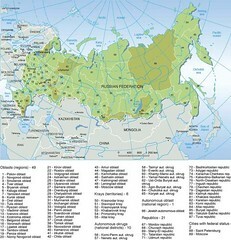 Russia has a total population of well over 143 million people. It has wide natural resources, including major deposits of oil, natural gas, coal, strategic minerals, and timber.It also faces formidable obstacles of climate, terrain, and distance hinder exploitation of natural resources. Major envionmental issues are air pollution from heavy industry, transportation in major cities, deforestation, soil contamination from improper use of agricultural chemicals, groundwater contamination from toxic waste and radioactive contamination. For any form of publication, please include the link to this page and give the creator credit (in this case Emmanuelle Bournay, Philippe Rekacewicz, UNEP/GRID-Arendal) If the high-resolution file is not available, please contact grid@grida.no for request and permission for usage.